Our personalised 'Be Our Page Boy' card is the perfect way to ask the little ones to be part of your day. His name is picked out in blue so it pops off the page. Adding his name will make him feel even more special and excited! 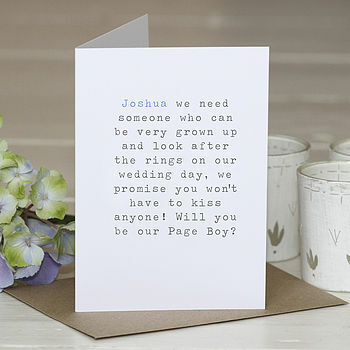 This card will be personalised with your page boy's name, please leave details when ordering.